Migration from Jupiter V4.X to Jupiter V5 will not be possible through Envato Toolkit. So you should update it manually using Appearance > Themes > Install Theme. To create a lighter WP, which is easier to use, we have removed the predefined patterns and textures from background selector. 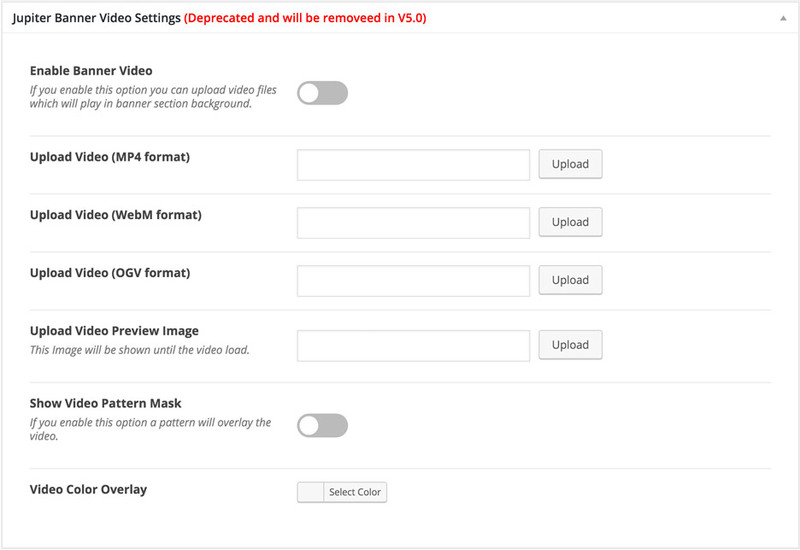 As you can see in the image below you are given only Custom and No Image options (comparing to V4 where you could also choose from predefined patterns). From background selector module upload the pattern using the custom method. Repeat this process for all locations where you have used predefined patterns. 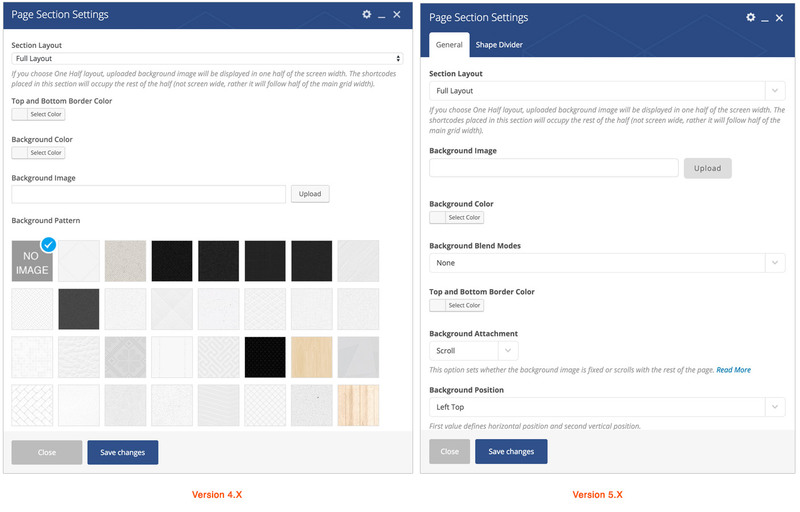 As with the background selector module, Patterns are removed from Custom Box and Page Section shortcodes. As you can see in the image below, the Background Pattern option is no longer available in V5 page section options. Unzip the package and find the patterns you have used in your site. Visit your pages and find locations where you see missing images. These options were deprecated in Jupiter V4.x and have been removed in V5. 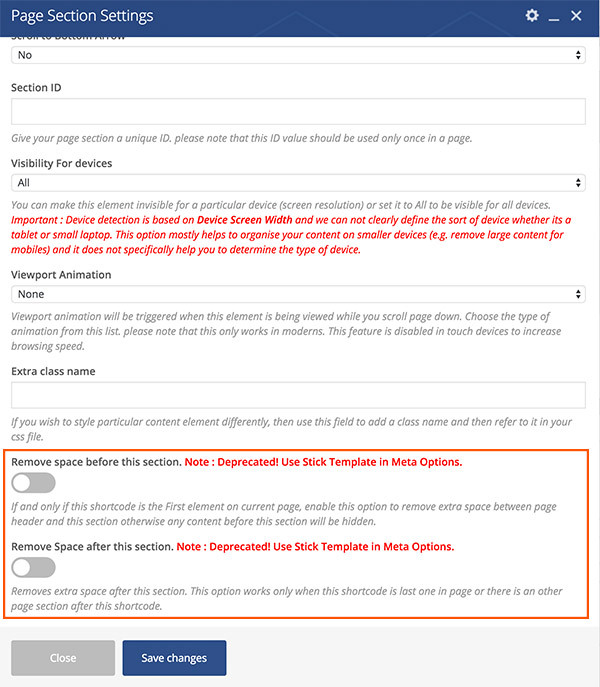 You will need to use the stick template option in post meta options to remove space between page sections. The meta options below were long deprecated and have finally been removed in V5. You can use Visual composer to create slideshows and page section shortcode for having video banner layers. We have removed them to increase rendering speed in post editing. Theme Options > Header > Start Tour Page option needs update. The “Start a Tour” module located in the header will need to be checked for option modifications. If you compare the screenshots below, you will notice you used to choose from options to select a link. However, in V5 you will need to paste a URL in the text field. Start a TourThis feature needs updates if you are using it in your website. In order to support the whole range of font weights starting from 100 to 900 font weights, we have added many more options. You may experience some font weight options being reset. Make sure you keep track of them before you update so you can check and set them again if required. We have removed “Self Hosted FontFaces” from theme as they seem to be one of those deprecated typography technologies. Instead we only offer full list of Google Fonts, Typekit and of course Safe Fonts. If you still wish to use a FontFace you will need to install Use Any Font plugin which offers custom font upload. If you have ever overridden Jupiter shortcodes in a child theme, there are a couple of things you need to do before migrating to Jupiter V5! In V5.X we have changed it to “architecture by feature” meaning that its configurations, styles, scripts and shortcode options stay on the same folder. You can also override its assets and options as well (which was previously not possible). In Jupiter V5 the WooCommerce single product image size is being managed from the location shown below. If you see quality loss in the image, simply go to the WooCommerce settings and change the size to 550×550 pixels. 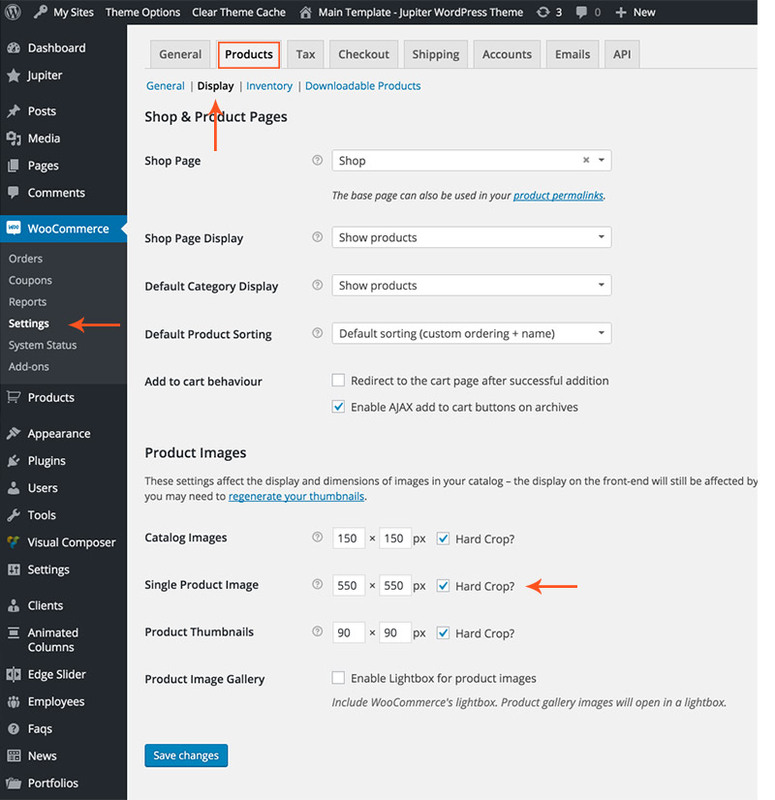 WooCommerce Single Image SizeImage size is now being managed by WP native resize.